Nature in Lombok has named Rinjani volcano as high as approximately 3,726 meters above sea level. Overall, the tourist destinations in Lombok is one of the most favorite visited by many tourists. The natural beauty and tourist attractions in Lombok exotic offers a unique character and memorable travel. Lombok Tourism is one of Indonesia's famous tourist destinations. Its reputation has been recognized by the international community. Mount Rinjani on Lombok are included third highest mountain in Indonesia. Various tourist attractions in Lombok are popular more dominated by the awesome beauty of its natural attractions, including beaches, mountains, and others. No one doubted how beautiful the beach in Lombok, a view you can see when sunrise and sunset. Visit some interesting places in Lombok will take you on a sightseeing trip memorable. If you like to surf, try try out the waves in Lombok. You will find a fierce wave of adrenalin. 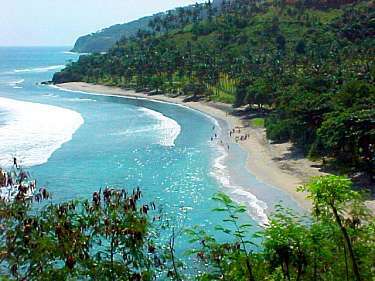 The following are a number of attractions in Lombok which is well known and worth a visit. 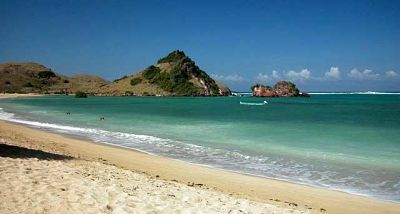 This is not the Kuta beach in Bali, but a beautiful beach located in the south of the island of Lombok. Lombok Kuta Beach is one of a number of interesting places in Lombok charming. Geographically, this beach is surrounded by hills nature. In addition, Lombok Kuta Beach has white sand beaches and generally not much visited by tourists. Do not be surprised if the beach was deserted when you visit them. Kuta Beach in Lombok is administratively located in the village of Kuta, located not far from Lombok International Airport. Itineraries Kuta Beach Lombok if taken from Senggigi will take approximately 1.5 hours. You will pass the city of Mataram if taking the route of travel Senggigi - Kuta Beach. It is a tourist place in the most famous Lombok. Senggigi Beach in Lombok has a beautiful beach that captivates. Many foreign tourists who come to this beach. Senggigi Beach was transformed into one of the attractions in Lombok with a view of its long coastlines, truly captivating when viewed from a distance and altitude. With a long coastline and firm, presenting Lombok Senggigi Beach sand shades from black to white. Seawater has waves that are not large, clear, and clean. The things that make Senggigi in Lombok become one of the favorite tourist spots for foreign tourists. This is the place to surf in Lombok that you should visit if you want to enjoy surfing or surfing. One of Indonesia's most popular surfing spots have also been named as one of 10 places to surf with waves vicious version of the International Surf Association. If you are challenged to surf at Desert Point, then you can take a trip with the ferry boat ride from Bali to Lombok Sheets port. Desert Point, local people call it the Bangko-Bangko, is a surfing beach destination located on the Southwestern coast of Lombok. If you have arrived at Sheet Harbor, then a trip to Desert Point reached by vehicle travel or rental car and takes about 2 hours. In Desert Point, available lodges and bed as simple as a venue. Desert Point is one of the attractions of Lombok interesting place to visit, especially among surfers. In Indonesia, some of the best surfing can be found on the beaches in Nias, North Sumatra, Plengkung Banyuwangi, Bali Kuta, up to Pelabuhan Ratu Sukabumi. Mount Rinjani is one of the tourist attractions in Lombok are officially designated status as a national park, which is a protected ecosystem Indonesian government with the character of mountainous rain forest and savanna. The area of this national park is about 40 thousand hectares. Mount Rinjani on Lombok, North section with a height of 3,726 meters above sea level, and is the second highest volcano in Indonesia after Mount Kerinci. Mount Rinjani has a wide crater, there is a crater lake called Lake Segara Anak. According to local belief, if the lake Segara Anak visible area, then it is a sign that the age of the viewer is still long. Conversely, if looked cramped, it indicates people who see short-lived. It is advisable to perform a clean themselves and spirited calm before looking back Segara Anak Lake. This lake can be used also as a fishing spot. Also referred to as three exotic island of Lombok who became one of the favorite destinations of foreign tourists. Gili Trawangan is located in the western part of Lombok has sea water is clear and crisp, clean white sand, coral reefs, as well as a charming variety of ornamental fish. 0 Response to "Attractions in Lombok The Mandatory You Visit"